It's always a plus to have something to look at, however the accuracy of drawings needs to be taken lightly. Most of the time they offer only a general outline but researchers can get consumed in over-reading the slightest of details. Therefore it's crucial that one is present to ask questions and receive clarifications as sketches are being made. In summer of 2001, "Ann", one of the surviving members of the 1954 sighting on Lough Fadda, was presented an artist's rendition of the creature they'd seen. She was quick to note inaccuracies with the drawing. The head and neck had been misrepresented to comply with the classic "Nessie" posture. She recalled a more blunted object emitting from an angle only slightly above the height of the humps. (The primary witness at the time, Georgina Carberry, had estimated the humps as two feet above water and the head three.) The mouth had been referred to as "like a shark's" by one of the principal witnesses which served as the inspiration for the sinister jaws. But based upon Ann's corrections the implication appears to have meant it was under slung (not unlike the Nahooin animal). One of the witnesses had also noticed a split tail but Ann didn't recall having seen one. 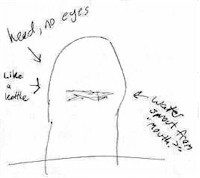 A sketch done by "SC" representing the creature observed by he and his family patrolling Lough Nahooin. The bottom drawing represents the animal as it first appeared floating in a patch of reeds. After becoming animated in response to the barking of family's dog, the animal began a series laps towards and away from the shoreline. A black head shaped "round like a kettle" would surface as it swam. Water appeared to sprout out of a slit-like mouth. S didn't recall any features on the head but according to F. W. Holiday his wife had noticed what appeared to be eyes or horns. During a barbeque held at cottage along Lough Auna guests noticed a curious object floating across the lake. At first appearance some had assumed it was an otter carrying young on its back but it soon became evident that it was a single object. Amongst the guests was retired Air Commodore Kort of the Royal Netherlands Air Force. Commodore Kort provided the curious drawing above. The ridge formation is interesting in that it doesn't appear to have been cited elsewhere.